What are the students supposed to learn? How will I know when the students have learned it? How should I respond when students experience difficulty learning? How should I respond when students already know the content? 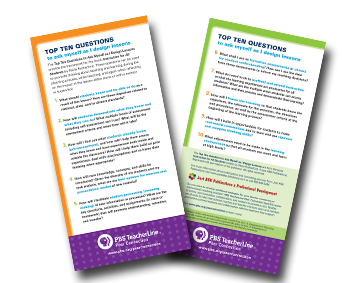 Because of the requirements of No Child Left Behind and each school’s quest to achieve AYP, many teachers are focusing most of their time and attention on the first three questions. Supporting struggling students to make sure they pass the annual achievement tests has become the primary goal in many classrooms. Certainly these students deserve our attention; and frankly, prior to the current emphasis on accountability, many of these children were given minimal support or sadly, ignored completely. Given that teachers have a finite amount of time to teach, they may not give the appropriate amount of time and attention to planning for students who are especially bright and capable and who can demonstrate that they have already mastered the current content. If we take the time to think deeply and critically about these capable students, we have to conclude that we are not doing them justice by ignoring their learning needs. In truth, we may be letting them slide by and instilling in them a set of values which are mediocre at best and have the potential of setting the stage for how they will deal with challenges and conflicts in their future. Best case scenario: They will succeed, independently challenge themselves in spite of a lack of academic rigor in the classroom, meet or exceed academic goals, and continue their pursuit of learning throughout their lives. Worst case scenario: They will temporarily remain compliant and complete the mundane tasks put before them, but eventually become completely turned off by formal education and end up never reaching their potential. If we are committed to the achievement of high standards by all students, we must address the learning needs of our high-achieving students as well as the students at the opposite end of the spectrum. It is not simply a professional duty but a moral responsibility. There are many educators who understand that addressing the academic needs of bright and gifted students should receive the same amount of attention as supporting the needs of students who have deficits or gaps in their learning. These talented teachers have figured out ways to differentiate instruction to meet the needs of each student by using a wide variety of instructional approaches and by continuing to explore with great passion new ideas that will support student learning. They see this kind of thinking as their acknowledged responsibility. But there are other educators who have not fully embraced the notion that gifted students need different learning experiences. In some situations, they have not been challenged by their leaders to provide differentiated experiences for their bright students. Others devote considerable time to ensuring that their struggling students are prepared for their annual achievement tests and they feel that they do not have the time to provide additional learning opportunities for their accelerated students. Some teachers have concluded that if they simply give those students more work to do, that will meet their needs and keep them busy. When students are not challenged, they may actually regress in their academic skills. As professionals, all educators must accept the reality that each and every student has the right to learn in an educational setting that matches their needs. In most classrooms today, teachers have access to a great deal of data about their students including standardized test results, report card grades from previous years or courses, and comments from past teachers. All of these data are important, but equally important is the teacher’s ability to learn as much as possible about each student early in the school year. Some teachers move beyond the basic pupil information to gather a wider range of data by administering a variety of inventories or surveys to their students in order to learn more about students’ learning styles, modality preferences or multiple intelligences. Prudent teachers also learn about their students through the basic practices of talking, listening, and observing student work habits. Finally, teachers should never underestimate the value of pre-assessment data to use as they tackle their next unit. Taking all these sources into account, teachers are able to plan learning experiences which both challenge student thinking and promote creative and imaginative results. Whereas some teachers embrace the idea of tapping into the inventive minds of their high achieving students, others are reluctant or resistant to stimulating or extending their students’ creativity or tapping into their gifts or talents at deeper levels. Some teachers say that they are not able to send students to the library for additional research because “our library policies do not allow us to do that.” Other teachers do not provide their students with independent projects to complete because “the students keep interrupting me with their questions while I am working with other children.” Still other teachers truly feel that “it is simply asking too much to have to design extra work” for students who have shown they already know the content. There are also educators who turn their gifted students into “mini-teachers” given the responsibility of teaching the students who are struggling. Finally, there are hard working teachers who frankly admit that they “do not know where to start” to challenge their accelerated students. I think that Nike has it right with their motto, Just Do It! Theorists, researchers, and noted practitioners have written extensively about ways to meet the learning needs of gifted students. See overviews of five of those approaches below. Students are motivated when they are given independent projects they can complete as well as a choice in how they can add to their learning. These assignments may take many forms including open ended questions, learning contracts, challenging existing ideas, potential solutions to real world problems, creative book responses, tapping into a student’s particular interest, or the testing of a hypothesis. When students work independently, it is important for the teacher and students to work together to determine clear outcomes, a timeline for the completion of the work, a rubric so each student can set learning goals, and checkpoints along the way to monitor the progress of the student’s work. Pre-assessment data may reveal that there are students who have little or no knowledge about upcoming content, students who have some background knowledge or understanding, and students who have a firm grasp of the knowledge or concept which is about to be studied. The teacher may provide work for the three diverse groups simultaneously by adjusting the level of complexity of the assigned work, the required structure and/or materials to be used, or the amount of concrete vs. abstract thinking necessary to complete the task. When teachers create tiered assignments, they often have students work in groups. It is no secret that many of our students know much more about technology and its seemingly endless applications than many of the adults in our schools. By encouraging students to extend their knowledge and thinking on a given topic through the use of technology, the students are able to discover new learning using an approach that is comfortable and exciting as well as “user friendly.” The work should move beyond passé or “old school” techniques such as PowerPoint presentations into arenas such as Web 2.0 tools that will give the student the freedom to explore technological applications in creative ways, and thus express their new learning with more sophisticated final products. There are many noted researchers who have well-publicized theoretical applications for learning in the classroom that can extend thinking by allowing students to tap into a learning strength, or give students the opportunity to create projects or make presentations in previously unexplored ways. Some theories which have achieved wide exposure and acceptance include Howard Gardner’s Multiple Intelligences Theory which emphasizes eight different intelligences, Robert Sternberg’s Theory of Successful Intelligence which focuses on analytical, creative and practical thinking, William’s Taxonomy of divergent thinking and feeling, Bloom’s Taxonomy which includes his six distinct levels of thinking, and Willard Daggett’s Rigor and Relevance Framework, to name a few. The use of any of these theories has the potential to motivate students to create work in previously unexplored ways that have gone unchallenged in the past. A number of writers, economists, and social analysts have forecast the skills that will be required to compete in the global economy of the future. The resulting work has been publicized under a number of headings including Partnership for 21st Century Skills, Skills for the Global Economy, and Literacy for the 21st Century. As a result of these prognostications, a pattern of necessary skills has emerged which should receive attention in our classrooms. The skills include collaboration, accessing, analyzing and validating information, effective oral and written communication, the ability to change and readjust one’s thinking, and a deeper understanding of the multi-cultural world in which we live. As teachers create learning opportunities for students, these skills can be integrated into student work and thus better prepare learners for successful futures. As new research about learning unfolds, so do the increasing number of instructional demands on a teacher’s time to plan and implement lessons. Teachers need all the support they can muster to meet the challenges set before them. Paula Rutherford’s newest book, Meeting the Needs of Diverse Learners, can serve as an excellent resource to meet the academic needs of exceptional learners. It is also important to remember that teachers do not have to go it alone in planning exciting lessons. When colleagues share their best thinking with one another, it can be a huge time saver as well as an opportunity to expand each teacher’s repertoire of instructional options. Whatever approach a teacher might take, the work for gifted students should be relevant, challenging, and provide ways for students to explore new ideas. As the teacher thinks about the design of these lessons, the primary focus should be on matching the learning approach to the learner to ensure that the work will peak the student’s curiosity, include deep thinking as well as quiet reflection, and lead to exciting and perhaps unexplored conclusions. Oliver, Bruce. “When Students Already Know the Content.” Just for the ASKing! November 2009. Reproduced with permission of Just ASK Publications & Professional Development (Just ASK). © 2014 by Just ASK. All rights reserved. Available at www.justaskpublications.com.